"We take nothing for granted" will be the message from Matlock boss Mark Atkins as they welcome basement club Droylsden to the Reynolds Stadium on Saturday. The Bloods, relegated from the Conference North at the end of last season, have had a nightmare season, collecting only two points from their thirty games played, and conceding 119 goals. They have lost all sixteen of their away matches so far. Everyone who faces them now will not want the tag of being 'the first side to lose to them' - and Atkins (left), will use tonight's training session plus his pre-match speech to emphasize that attitude will play a big part in Saturday's fixture. 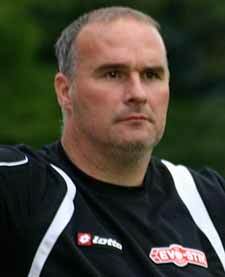 "Droylsden have nothing to lose so they will come here trying to get the points. We've lost to teams in leagues below us in cup competitions this season, so nothing will be taken for granted" stressed Atkins. Matlock will be hoping to record their second league double of the campaign after a 4-1 win at the Butchers Arms in October. "I think this will be a more difficult game for us. They've made some good signings recently including an experienced goalkeeper (Kendal's Craig Dootson) plus some younger lads who've been at this level" Atkins continued. One of those younger players is striker Sam Madeley, whose two goals played a big part in Matlock's 3-2 Derbyshire Senior Cup defeat at Glossop North End in December. Atkins feels there is an added pressure in facing teams in Droylsden's position, "There's a bit more pressure because it's sometimes easier to play against the top sides. Nobody wants to be the first team to lose to them, so our attitude and commitment has to be spot on and our preparation will be just the same as it is for any other game." The Gladiators visit to Stamford ended prematurely when a severe thunderstorm halted proceedings with only 23 minutes played with the scoresheet blank. Matlock maintained their eleventh spot and will be wanting to gain maximum points this weekend to maintain their outside hopes of finishing in the end of season play offs. Atkins reflected that it was a pity when the storm came, "It was disappointing for us for I felt we were on top and, having created a couple of chances, we thought a goal was coming and we could have gone on to win it. "In hindsight it was the right decision, for it continued raining for about another half an hour after the decision was made, but initially, I felt the referee might have waited another ten or fifteen minutes before calling it off." Lewis McMahon (left), passed a fitness test to surprisingly start last weekend but will need another check on his groin this week before a decision is made as to whether he will face the Bloods. 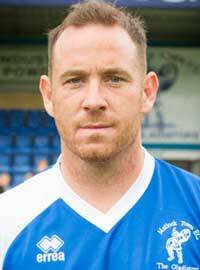 Current player of the season Adam Yates may be fit to return after fracturing his cheekbone at Glossop. The central defender had targeted the Droylsden clash for his comeback three weeks ago, but Matlock have no need to rush him back with David Haggerty and Oscar Radford currently in outstanding form at the heart of their defence.